Every Metro city has its own importance and uniqueness. But Sub-city Dwarka has various feathers to its cap. It is the largest sub city of Asia. It has impressive construction or wide road network or green shady avenues of majestic trees or good shopping complexes. Of course most of these are exclusively the VIP area or those which habited by the rich, powerful and the famous. The magnitude, extent and quality of life have given rise to a new adjective in day to day life of the ‘sub city’. 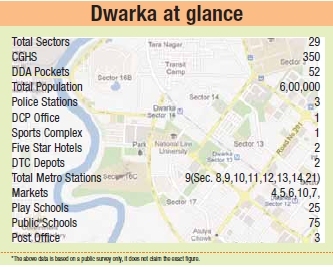 That’s exactly what the Dwarka subcity has achieved within a short span of time. The sub city spreads in 29 sectors, with over 6 lakh population living in around 500 DDA pockets and societies. It has well laid out roads, service lanes, road dividers, market areas and even accessible work places. 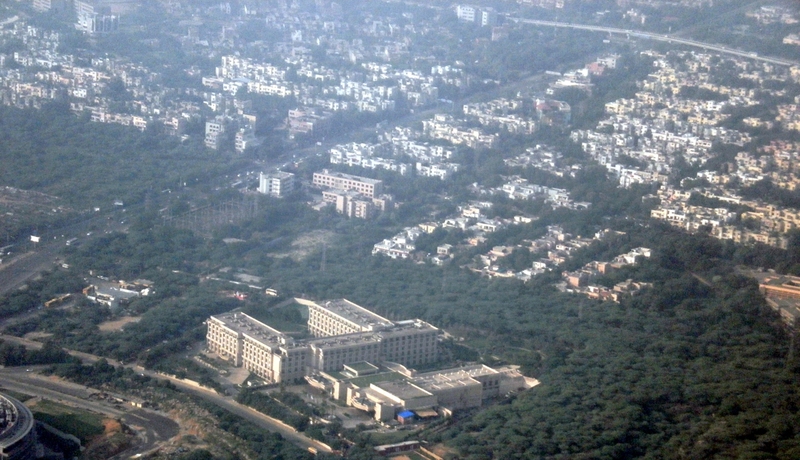 A number of institutions/organization office such as National Law University, Guru Govind Singh University, National Science Institute of Technology, Centre for Cultural Resources and Training (CCRT ), Medical Council of India, National Highways Authority of India (NHAI), Intellectual Property Rights (IPR), All India Football Federation (AIFF), National Board of Examination, Sports Complex, Shopping Malls/ Markets and District Courts, have been established here. Radisson has already opened its doors as so has Wyndham another five star hotel. Metro connectivity is the lifeline of the sub city. 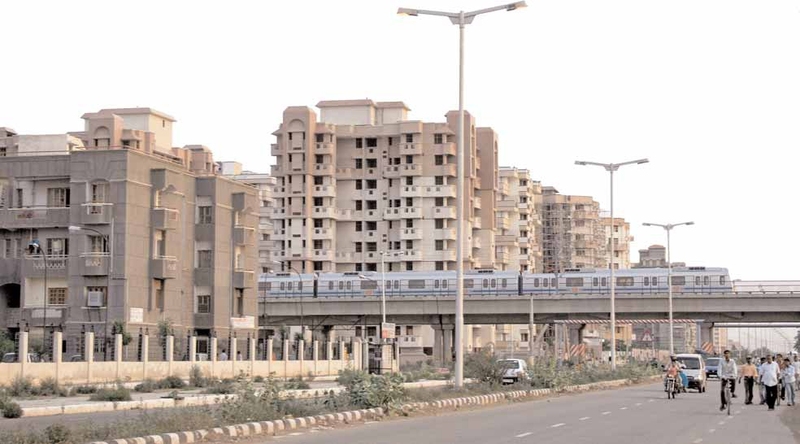 Now with the Metro Express coming too, connectivity to the airport and central Delhi has brought more comfort for Dwarkaites. On the roads front, the flyovers and underpasses have helped in improved connectivity to south Delhi and Gurgaon commuters. The longest flyover of the capital built over the Palam railway crossing has eased commuting. The wide metalled roads are a driver’s delight. People from different states of India live here. Despite this diversity, there is a unique sense of bonding that has developed. The annual cultural calendar of the sub city symbolises the national mosaic of religious traditions that lends its harmony to the life here. Celebrating not only national festivals like Republic Day, Independence Day, Gandhi Jayanti, Holi, Diwali and Dusshehra but typical regional festivals like Ramlila, Vaisakhi, Chitragupt Puja, Ugadi, Gudi Padwa, Ganesh Chaturthi, Onam, Bihu, Chathh Puja, Durga pooja, Christmas Carnival, Guru Parv, have led to an integration of the societies. It is indeed a pleasure to be a part of the development of a multifaceted and a truly millennium sub city providing so much exposure. The market of Sector-6 and 10 is the oldest market of Dwarka and there are faithful shoppers who regularly visit the market inspite of many shopping complexes being formed. Moving towards Aashirwaad Chowk market which comprises of markets of Sector 4, 5, 11 and 12. Here you’ll find an inexhaustible range of branded stores. Of course there are many more garment shops, kitchenware, hardware, grocery, jewelery, customs goods shop, wine shops, stationery & Sports shops. 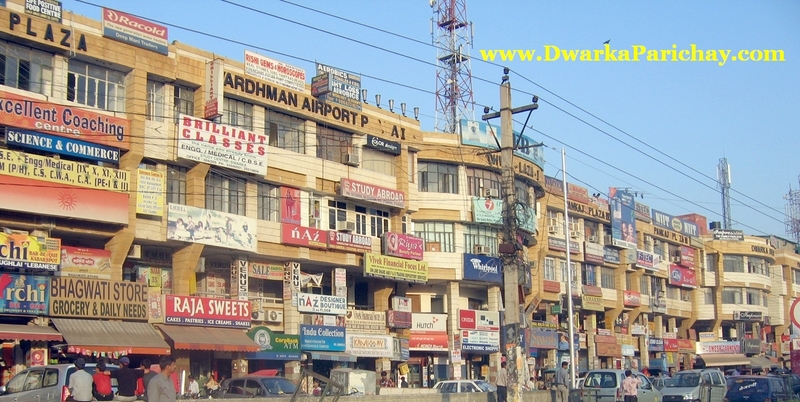 The Ramphal Chowk market at Sector-7 is also becoming a hot destination to shop for Dwarkaites. With the advent of flashy electronic good showrooms, banks and ATMs, automobile showroom, the market appearance is completely transformed. Besides regular markets, there are shopping malls in Dwarka – Vardhaman Star Citi Mall in Sector-7, Vardhaman Crown Mall in Sector-19, Vardhaman City Mall in Sector-23 and Manish Global Mall in Sector-22. Painted in attractive red, blue and yellow, these are actually shopping complexes converted into so called malls by private builders. Raja puri also offers a sound business opportunity with an attractive investment potential. This neighbourhood clutch of shops that, over the years have grown in importance got a face lift when giants like Sabka Bazar, Rebook, Woodland, Lilliput and other branded showrooms moved in. The market is also popular for Parichay, the factory outlet shop and Aggarwal Furnishing Store. It has one Indian Post Office Frenchise where you can avail all the postal facility. The area has infrastructural advantage as the rentals are cheaper here than that of Dwarka. Space here is easily available and there is scope of expansion unlike in showrooms of Dwarka. This market can cater to areas of Dwarka as well as Palam, Kakrola, Uttam Nagar and Mahavir Enclave. Centre for Cultural Resources and Training ( CCRT )-The Centre for Cultural Resources and Training (CCRT) under the aegis of Ministry of Culture, Government of India is located at 15-A, Sector – 7, Dwarka. This has moved here from its earlier premises at Bahawalpur House, near Mandi House. CCRT has been instrumental in raising the awareness about India’s culture and heritage as well as bring to the limelight the talent and beauty of the country’s rural artisans and performers. The Dastkar Mela, regional film festival and summer camps are all innovative initiatives of CCRT to showcase and disseminate this mosaic of art and culture amongst children and adults. The CCRT Auditorium has proved a big hit and has become an important landmark in Dwarka for all cultural activities. National Highways Authority of India ( NHAI )-NHAI which has its office at Sector 10, is the nodal agency entrusted with the responsibility of implementing the National Highways Development Project (NHDP) on Government of India’s behalf. NHAI has an expansive and impressive building at Plot No-G-5 & G-6, Sector-10, which indeed is a landmark in literal terms. A part from the improvement, maintenance and augmentation of the existing National Highways network, NHAI is entrusted with the implementation of road safety measures and environmental management. Intellectual Property Rights (IPR)-The Intellectual Property Rights (IPR) Office building have now graduated to this modern integrated complex in Sector- 14. Dwarka. The Indian government felt the need to set up integrated IP offices, with patents, designs, trademarks and geographical indications all in one building, so as to increase the efficiency and availability of all IP related services. The special feature of the Delhi IPR Office is that not only patents, but trademarks, copyright and geographical indications are all housed here. 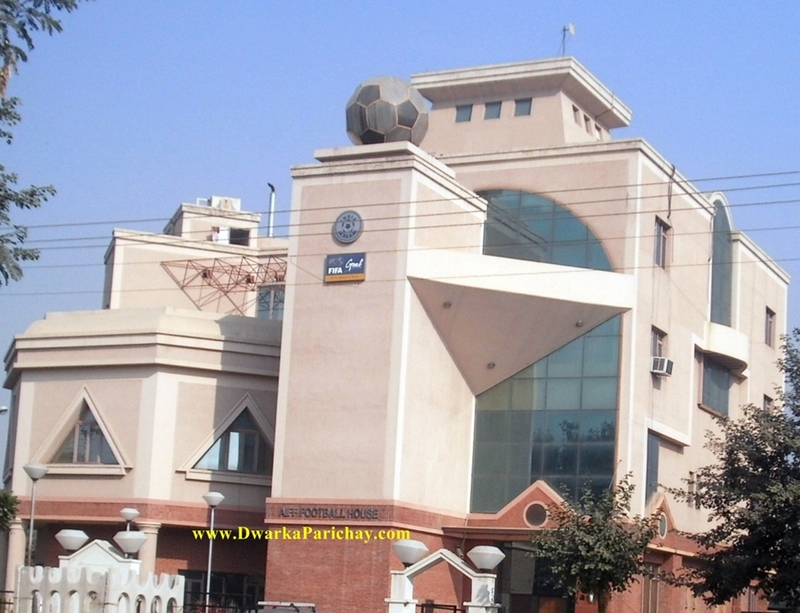 Football House- The Football House, the head office of the All India Football Federation (AIFF). The new ultra modern construction is located at Sector 19. AIFF has moved from Goa to Delhi. The building spanning an area of 2000 sq metre, is a 3-storeyed, state-of-the-art construction and houses the various departments including administration, coaching, competition, accounts and media. 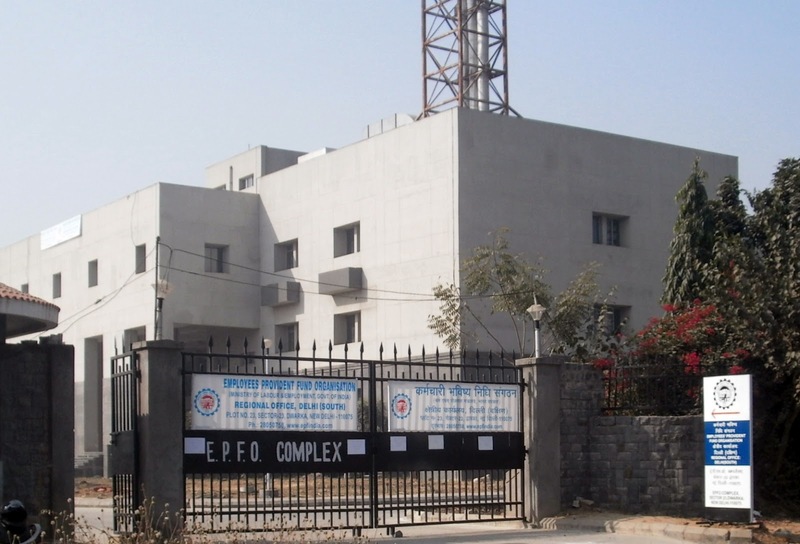 Regional Provident Fund Office: Employees Provident Fund Organisation’s branch is located at plot no.23 in Sector-23. The office is functional for South & South west Districts only. Dwarka Court has become the legal solution for the residents of South West Delhi.It was inaugurated by Hon’ble Chief Justice of India Sh. K.G. Balakrishanan on6th September 2008. 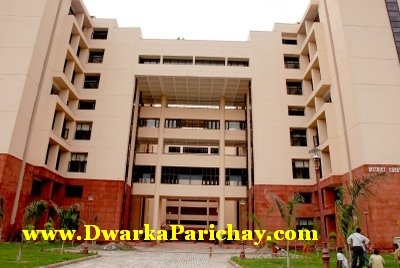 According to reliable sources of Dwarka Court, presently there are 45 courts in operation. It has a unique family Court which is also the Head Quarter of Delhi. It deals the family related disputes matters. Ms. Deepa Sharma is the Principal Judge of the said court located in Wing C, Room No.307. Apart from the said court, Special Court Narcotics(NDPS), Two Motor Accidents Claim Tribunal (MACT), two special C.B.I. Courts, Special Electricity Court, three Additional Judge courts, thirty Magistrate Courts out which three traffic courts, one Municipality Court(MCD). The whole complex is divided in three wings namely Court complex block, admin block and lawyers block. The complex has public utility facilities like bank, Post Office etc. and has local lock up and police post. The Dwarka court is handling the cases of South West Districts only. The complex has Delhi Legal Services Authority cell. There is a provision of free legal assistance cell for the poor people who are unable to afford the lawyers fee. There are two facilitation centres from where any one can avail information personally or at the helpline no. 28042850-7 from 10A.M. to 5 P.M. on all working days.